Everton host Arsenal on Sunday afternoon at Goodison Park as both clubs look to reignite their Premier League form. 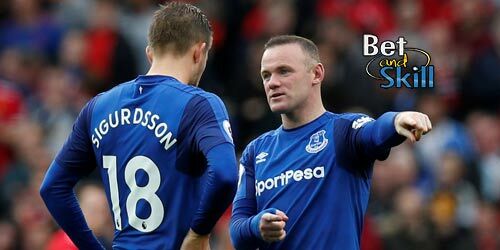 Read this article if you are looking for the best Everton vs Arsenal betting preview with predictions, betting tips, starting lineups, team news, odds, betting offers and no deposit bonuses! Everton have had a miserable campaign so far, and this was compounded by their 2-1 defeat to Lyon in the Europa League. They needed a 90th-minute penalty from Wayne Rooney to salvage a point at Brighton in there most recent league outing. They have managed only two wins from their opening eight Premier League games despite spending heavily in the summer. After a run of six defeats from ten games, confidence has collapsed among the Toffees' players and fans as Ronald Koeman's men are just two points off the relegation zone. Wayne Rooney, Leighton Baines and Phil Jagielka were all rested on Thursday night, and should return to face the Gunners. Ronald Koeman faces some tough choices as to who to start in attack with Nikola Vlasic, Gylfi Sigurdsson and Dominic Calvert-Lewin favourite to support Rooney up front. Oumar Niasse, Tom Davies, Davy Klaassen, Sandro Ramirez, Kevin Mirallas and Ademola Lookman are the alternatives. Idrissa Gueye and Morgan Schneiderlin should both keep their places in central midfield as well as Mason Holgate, Michael Keane, Jagielka and Baines in defense. James McCarthy could make his first appearance of the season after stepping up his return from injury with the U23s on Monday. Ross Barkley, Seamus Coleman and Yannick Bolasie all remain sidelined. Arsenal lost 2-1 against Watford last weekend but responded with a 1-0 win away to Red Star Belgrade in Europa League after a delightful Oliver Giroud goal. The Gunners are nine points behind leaders Manchester City in Premier League and have looked vulnerable this season, particularly away. Arsene Wenger's men have one of the worst away record in the top flight. Their only point on their travels was in a creditable 0-0 draw at Chelsea, while suffering defeats also at Stoke and Liverpool. As to direct matches, Arsenal have won four of the last five matches between these clubs. Laurent Koscielny, Aaron Ramsey and Alexis Sanchez are all fit to play according to Arsene Wenger. They will all make the starting lineup, with the Chilean likely to join Alex Iwobi in the offensive midfield section behind Alexandre Lacazette. Danny Welbeck has been ruled out with a groin injury which is likely to keep him out until after the international break. Hector Bellerin and Sead Kolasinac should continue in the wing-back positions while in midfield Mohamed Elneny could drop to the bench. Calum Chambers and Shkodran Mustafi are out, while Santi Cazorla is a long-term absentee. "Everton vs Arsenal betting tips, predictions, lineups, odds and free bets (Premier League - 22.10.2017)"